After about an hour of walking in the rain, a little cold and weather-weary, we ducked into the nearest restaurant to get warm and grab lunch. The ambiance of the restaurant Kaiku was instantly inviting. Lucky for us, there was one table left in the busy restaurant. We ordered a glass of Irouléguy wine and cheered to our “find” as the aroma of food cooking in the kitchen wafted around us. From glancing at the food on tables around us (we usually do this in a new-found place), we knew this was going to be good. 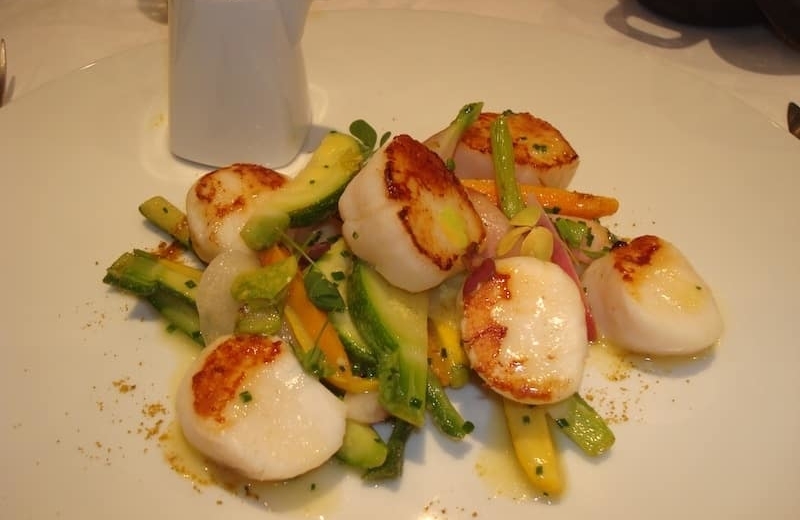 Finally warm, we ordered a lunch of roasted scallops with lentilles and seasonal vegetables (Les coquilles St. Jacques roties, lentilles du Puy et légumes de saison) and lamb served with a pot of Tarbes beans and seasonal vegetables (l’agneau de lait avec Tarbes et légumes de saison). While we shared our plates and raved about the food, we agreed to come back some day. The food, visually appealing, was delicious – all of it! The chef, Nicolas Borombo, is very proud of his Basque culture and says he is “in love” with local cooking traditions. He personally knows local producers and uses only the finest ingredients from them in his cooking. So – the rain didn’t go away but after our unexpected food-find, we were warm and well-nourished and ready to discover the town. What more could we ask for? Sometimes, you just make the right turn and happen upon a treasure. And that happens so easily when you’re in France!